If you’re a fan of the great outdoors and looking for a unique way to celebrate a wedding, party or just upgrade your camping game, then our guide to 2018’s Best Tipis For Hire could be just what you need. The word tipi originates from the Sioux tribes where it literally translates to ‘a dwelling’ and although usually associated with the Native Americans, indigenous Europeans were also early adopters of these cosy structures. As the years have gone by we’ve thankfully moved away from the whole animal skin vibe and you can now find lots of amazing suppliers offering amazing, authentic tipis without any buffalo involved. Increasingly popular at events across the country, tipis can provide an exclusive and memorable experience for your guests. 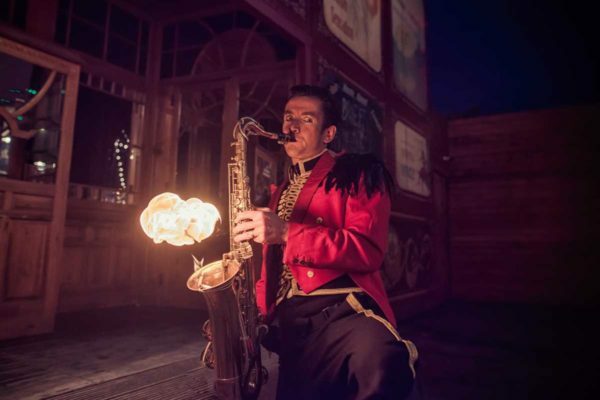 The very best tipi suppliers will be able to accommodate everything you need, from your dance floor to catering and there are a variety of structure sizes available to fit every occasion. So, whether you’re organising a festival, planning a party or just looking to hire a structure to protect your guests from the elements, then a tipi may be the answer. 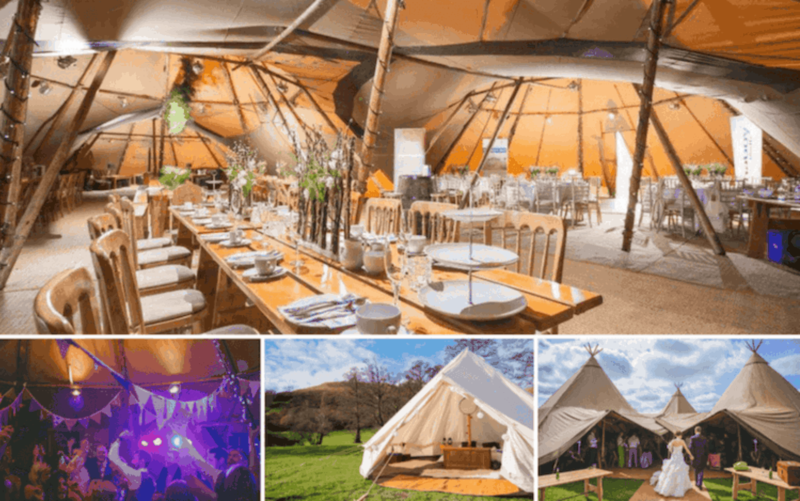 In our collection of the best tipis available for hire we’ve selected our favourite suppliers based on their range of tipis, quality of service, customer reviews and most importantly, the personalities and stories behind the businesses. First up we’ve got BAR Events UK, founded by husband and wife team Dan and Laura. The Yorkshire-based duo had been in the events and hospitality business a combined 30 years before founding BAR Events in 2008. 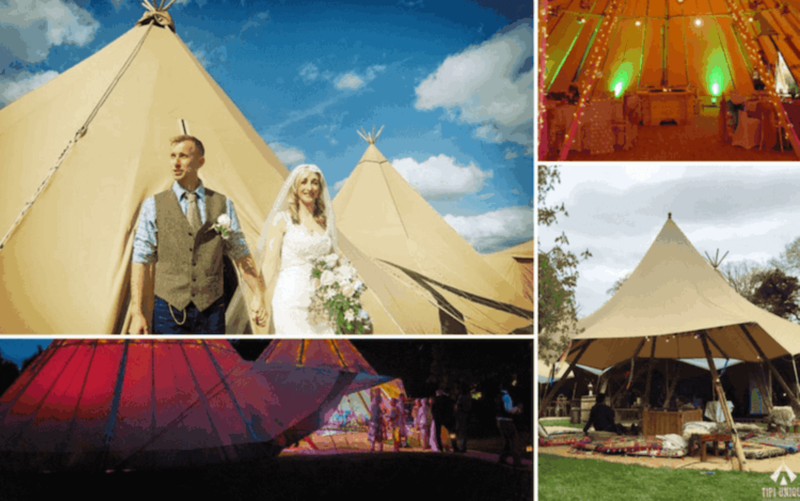 The company has grown from events staffing, to renting mobile bars and, crucially for this list, supplying gorgeous ‘Giant TeePees’! These impressive tents are a whopping 10.3m in diameter and can be equipped with a fire pit (for those winter months), fairy lights, long wooden tables and benches plus woven flooring throughout. But that’s not all! They also hire ‘Snugs’ which can link to a giant tipi, adding space for a chill out area or bar. These can also standalone (8.3m diameter) to create a cosy hideaway or dance floor area. Perfect if you’re looking to organise a wedding or party and want somewhere for guests to relax. Another husband and wife combo, Tipi Unique is the creation of Karen and Mat (pictured above). When Mat popped the question in 2013, they began planning their dream wedding but couldn’t find a tipi available for hire that felt individual to them. This desire for a unique experience led to the creation of the Tipi Unique company, with the goal of creating memorable tipi weddings and parties for others. 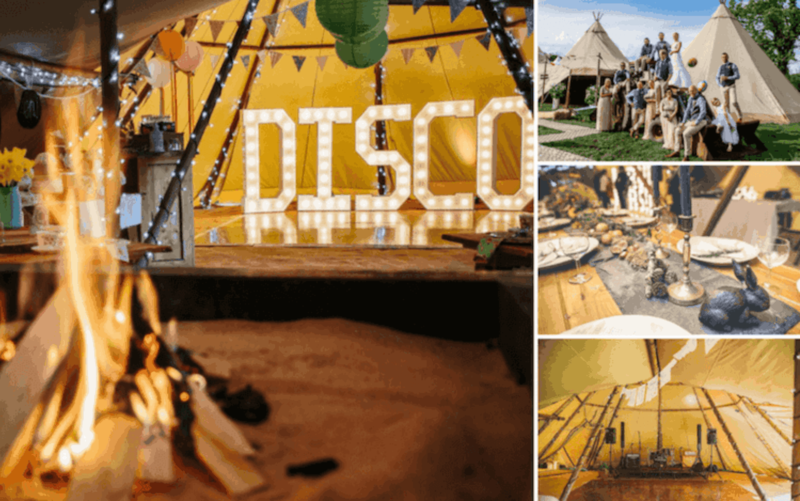 They offer three types of tipis for hire: Giant tipis, Kung tipis (slightly smaller and can link to a Giant) and Pagoda’s which are perfect as a catering tent, dance floor, cloakroom or even just storage space! We love their personal touch and passion for creating unique events for their customers. 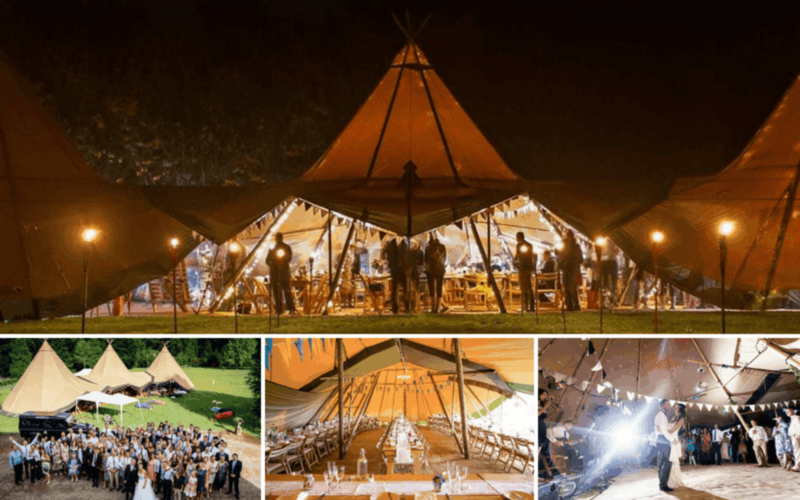 Established in 2011, Wedding Tipi are a family run business based in Carmarthenshire covering Mid, South, and West Wales along with the borders. Founder Stephanie wanted to connect more with her love of the outdoors, so made the decision to move away from her career in the hospitality industry and follow her passion. The rest, as they say, is history! Wedding Tipi’s secret weapon are their Nordic style Kata Tipi’s - iconic event structures often seen at festivals, sporting events and weddings. Perfect for cosy gatherings they come equipped with internal fire pits, Nordic benches, and tables with ambient lighting. For larger events they can be linked together in various formations. They also hire Octo and Bedouin Stretch Tents (suitable for 60-300+ guests) which offer real versatility and can be deployed virtually anywhere – field, courtyard, forest, town centres or even a beach! The first siblings on our list, Teepee Tent Hire was set up by brother and sister Thomas and Charlotte. They specialise in hiring out a range of ‘luxury’ tipis for festivals, weddings, and other events across the North West and beyond! Fortunately for them, their father is in the timber and joinery industry which made is easy to source the best timber for creating their own rustic wooden tables and benches, which soon expanded into bars, doors and fire pits! Their UK manufactured tipis are designed to withstand even the nastiest British weather conditions and can be constructed in a variety of different ways to suit you and your event. They say the tipi is like a blank canvas for your event – the possibilities are endless! Our final supplier is another husband and wife team – there’s a theme here – and once again it all started with their own wedding. The company was born in 2010 and the following year Matt and Niamh provided tipis for 40 events across the UK. Not content with that, they have consistently grown the company (and their family!) 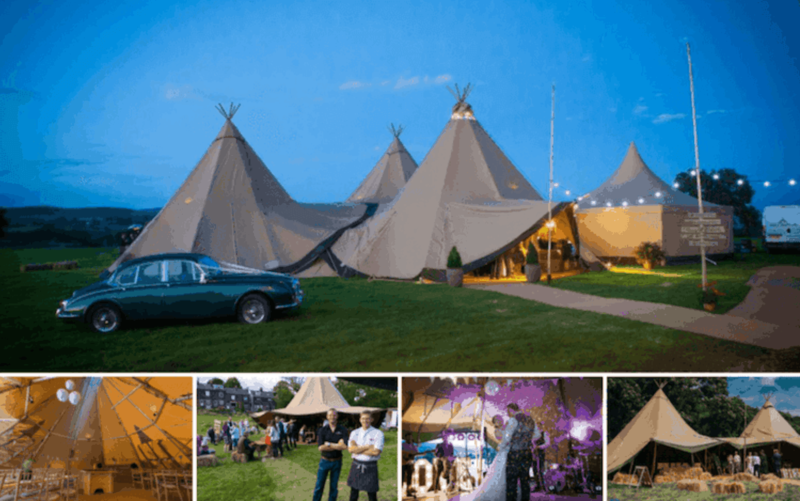 since then and last year supplied over 120 events with amazing tipis! 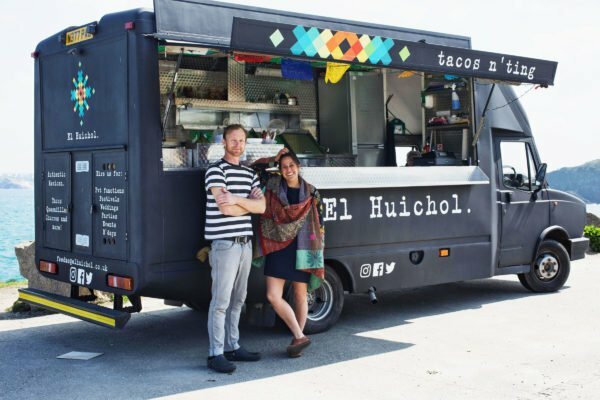 Whether it’s a festival, corporate hire, wedding or just an excuse for a party, these guys will have a tipi or a stretch tent to suit you. They even offer a glamping option, so if you’re thinking about a weekend away or a festival upgrade, this could be something to consider. Their bell tents can come fitted with shaggy rugs, double or single beds, decorative coffee tables, luggage storage, lighting and even hotel grade bed linen! So, the secret is out! There are fantastic Tipi suppliers all over the country who offer beautiful, unique tipis and tents that even the indigenous peoples of America and Europe would be proud of! And if that’s not enough, you can find even more inspiration in our Tipi Hire section. You’re sure to find the best tipi hire for you whether you’re planning a wedding, corporate event or just an excuse for a big party! If you're ready to book a Tipi or Tent for your event – simply fill out a free request form and receive quotes from the best local suppliers.